Check out what's happening on our Instagram page. Flames erupt from its metal mouth. You can feel his roar rumble in your chest as its jaws crunch through an old car. Meet Megasaurus... He's a fire-breathing, car-eating attraction at Maize Valley in Hartville every fall. WKYC's Jasmine Monroe checked him out this morning, AND she got to shoot pumpkins from a cannon. Learn more here. Wow! 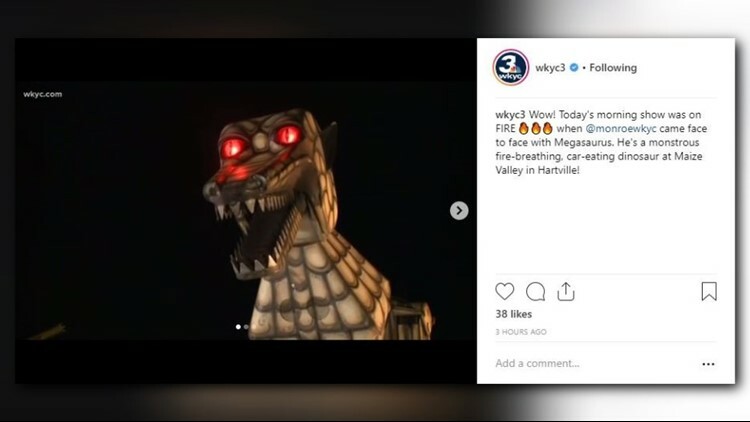 Today's morning show was on FIRE 🔥🔥🔥 when @monroewkyc came face to face with Megasaurus. He's a monstrous fire-breathing, car-eating dinosaur at Maize Valley in Hartville! BOOM! @monroewkyc sent pumpkins flying out of a cannon at Maize Valley in Hartville. 🎃 Plus, @maureenkyle and @holliestrano got a few good laughs from their crew. A familiar face will be joining the WKYC morning team next Monday. Any guesses?